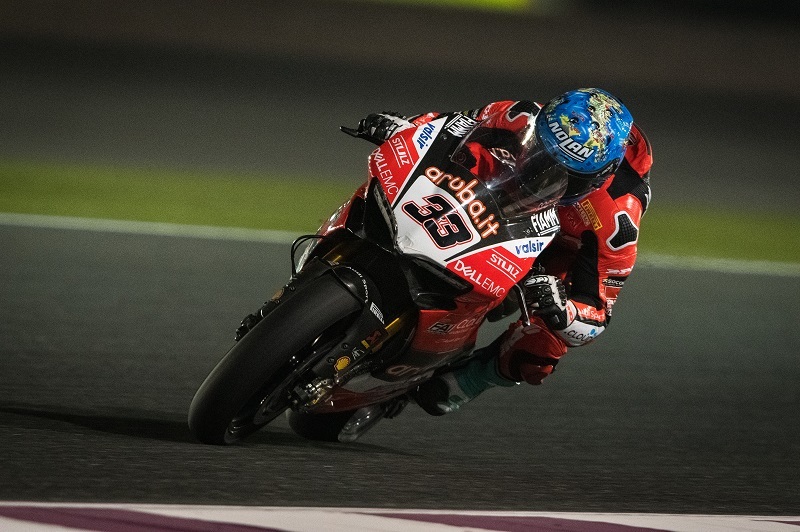 With 12 rounds in the books, the Aruba.it Racing – Ducati team started today the final act of the 2018 WorldSBK Championship, which is held under the floodlights at Losail (Qatar), the only track on the calendar to host night races. After three free-practice sessions, Marco Melandri and Chaz Davies are respectively seventh and ninth in the provisional rankings, and both will go directly into Superpole 2 tomorrow. Melandri, after starting off with the right foot in FP1, focused his work on improving grip in a track that is historically difficult under this aspect due to its proximity with the desert. The Italian took a second and a half off his best time through the day and finished with a 1:57.924, +0.601 seconds from the top. Davies also centered his program on finding more grip, progressively improving his performance to finish just behind his teammate in ninth position (+0.763). The Aruba.it Racing – Ducati team will resume action on Friday, October 26th, at 14:25 local time (CET +1) for one last free-practice session ahead of Superpole and Race 1, scheduled to start respectively at 16:30 and 19:00.